Our group exists because of the friendship and collaboration of the batch mates of Ananda College. Some of the batch mates who were part of our group are no longer with us to enjoy the companionship we have. Nishan Pothmulla, Mahesh Galhena, Darshana Peiris, Janaka Radella and Gayan Chathuranga are our batch mates who we dearly miss. The only thing we can do now is to remember them and conduct thoughtful activities in their memory. 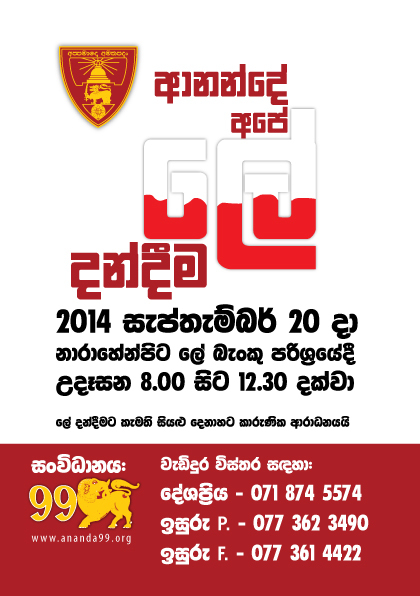 We are conducting our annual Blood Donation Campaign on the 20th of September 2014 and we are encouraging all of our friends to attend to this event and bring along others who would like to donate their blood. We will be inviting the families of our lost brothers to join the event as well.